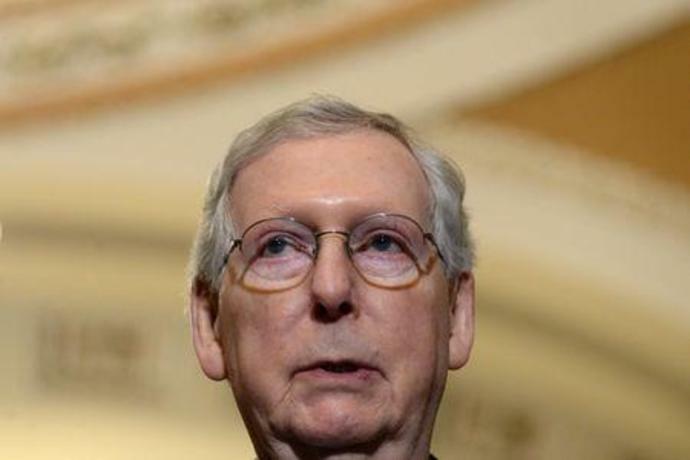 WASHINGTON (Reuters) - U.S. Senate majority leader Mitch McConnell on Monday blocked a second attempt by Democrats to pass a measure aimed at prodding the Justice Department to release to the public Special Counsel Robert Mueller's report investigating Russian meddling in the 2016 U.S. presidential election. Earlier this month, the House of Representatives voted 420-0 in favor of making the report public, with no Republican opposition. On Sunday, Attorney General William Barr informed Congress that Mueller had concluded that President Donald Trump's campaign did not collude with Russia to influence the outcome of the 2016 election. But the probe left unresolved the question of whether Trump engaged in obstruction of justice. "There is no good reason not to make the report public," Senate Democratic leader Chuck Schumer said. The Justice Department has not said whether it will release Mueller's full report, but Barr has said he will be as transparent as possible. McConnell, noting that it took nearly two years for Mueller to conduct his investigation, said: "It's not unreasonable to give the special counsel and the Justice Department just a little time to complete their review in a professional and responsible manner." The legislation does not set a deadline for the release of the report, and merely expresses Congress' desire that it should be made publicly available. The chairman of the House of Representatives Judiciary Committee, Jerrold Nadler, a Democrat, said on CNN on Sunday that he would "try to negotiate" with the Justice Department to obtain the full report, but the committee would issue subpoenas and litigate if needed. Trump vented his anger on Monday at the Mueller inquiry and vowed investigations into unnamed political enemies who did "very, very evil" and "treasonous things."